Be wrapped up with adventure with this trendy leopard cardigan sweater by Josephine Studios! 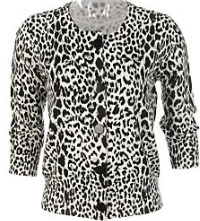 This cardigan features abutton down front, 3/4 sleeves, round neckline and a fashionable animal print. A stylish cardigan sweater that is easy to wear and provides a flattering fit.